Last Friday Jeff Boeke gave a lecture on his work to synthesize and recombine entire yeast chromosomes. As a senior guy in the field he is one of the handful of people, along with George Church, Craig Venter, and possibly Chris Voigt who have the resources and freedom to tackle genome-scale projects such as this. The large majority of his talk was devoted to the building of synthetic Yeast chromosomes, a process that he started using commercial ventures but quickly turned the exercise into an undergraduate class. Jeff’s build-a-genome class began at JHU and now has collaborative partners throughout the world. The basic ideas was to use overlapping primers to assemble larger fragments which would eventually be pieced together in-vivo by homologous recombination. The sequencing costs have dropped and he can buy much bigger starting chunks but the idea is the same - get lots of students to build lots of small fragments and build them into successively bigger fragments. The team incorporated loxp sites in the 3’ untranslated region of each gene which allows him add CRE recombinase to the mix resulting in random transpositions and losses. The scrambled genomes can then be assessed for some function. Jeff showed us some data where the “function” was simply what was viable. Is there anything particular that is required for viability? Besides the fact that there were some essential genes which must always be present there didn’t seem to be a pattern. Lot of genomes survived the reshuffling although there did seem to be a general trend towards smallness. This one only the shuffling of a single chromosome. He has built up several of the other chromosomes, can shuffle them individually and then mate them together allowing his team to create a virtually unlimited combination of yeast genomes. He showed one application of the shuffling technology which was near and dear to my heart: the shuffling around of the violacein gene cluster. 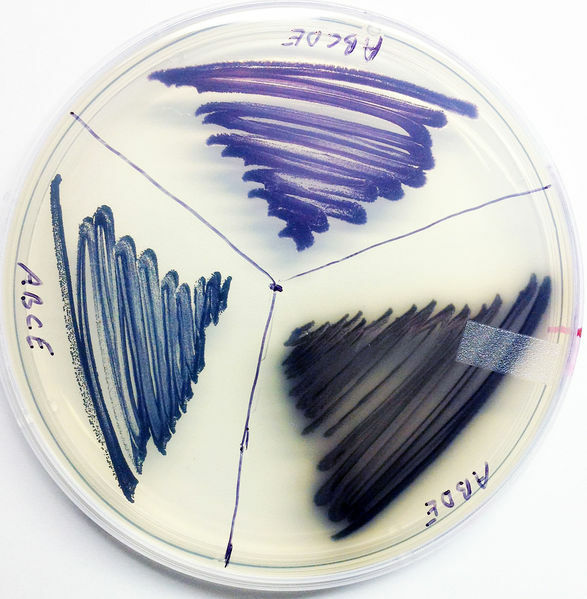 Violacein is a tryptophan dimer with antibiotics properties and a beautiful violet color. A graduate student, Fang Chang, spent his graduate career elucidating a number of tryptophan dimer small molecules from gene clusters recovered from environmental DNA and successfully defined a number of new compounds including a new structural class. Very cool. So violacein is a beautiful molecule and its gene cluster is only 5 genes big. By recombining these genes you can generate a slew of combinations where the violacein and multiple violacein-like compounds that differ in their oxidation pattern are in a single clone. The result if the combinatorial shuffling of the violacein gene cluster is a veritable rainbow of colonies. Although a very simple problem, these pictures are always a cloud pleaser. Jeff also showed the combinatorial shuffling of a carotenid pathway. In the end I would day that Jeff seemed almost sheepish in his presentation. His results are a large technical achievement with great potential for synthetic biology generally. Certainly synthetic biology in yeast is where a number of breakthroughs are bound to be made, but it seems we are still await a crowning achievement of the combinatorial reshuffling approach. I have some ideas though…..